Courtesy of Your Castle Real Estate Inc.
Answer the phone, this home is calling you! This Brighton East Farms gem is ready for you and has so much to offer. 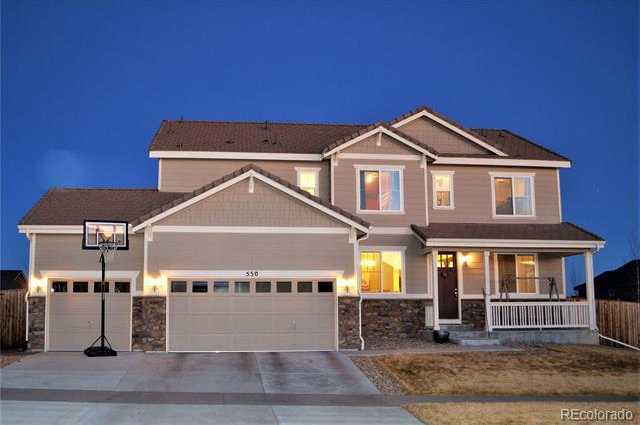 This home sits only steps away from a large park area complete w/playground & open space for all that summer time fun. Your new home has cathedral ceilings, plenty of natural light, gourmet kitchen w/double ovens, a separate family, living & dining room, 4beds up, plus an office on the main! Kitchen is complete w/granite, a pantry, and eating space all open to the the family room. Your master is oversized w/a walk-in closet & 5pc bath w/large soaking tub. The yard is spacious w/a play area for the kids, gardening boxes on the side but the BONUS is the side space allowing for a camper, RV, trailer, etc. These homes area allowed to have an open gate & concrete for side parking or storage. This home has all you need, space for everyone plus un-finished basement ready for your finishing ideas & the potential to store your toys at home... Priceless! Show it, Love it, Sell it. Please, send me more information on this property: MLS# 4175273 – $543,000 – 550 North 45th Avenue, Brighton, CO 80601.